Simple chord-finding process - and the added bonus of a tuner makes this a useful accessory for songwriters and strummers. More than just a tuner. 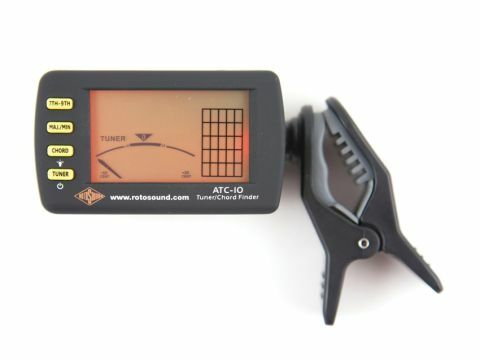 In an effort to stand out from a seemingly endless selection of clip-on guitar tuners, Rotosound has put a little extra thought into its own offering and included a comprehensive chord finder. The first button selects the chord letter or root, while the 'Maj/Min' button scrolls through major, minor, diminished, augmented and suspended. Finally, use the '7th-9th' button to narrow your search down to the more obscure shapes.